But for the timely intervention of the Ghana National Fire Service (GNFS), the Accra financial Centre located at Ridge would have been engulfed by fire. 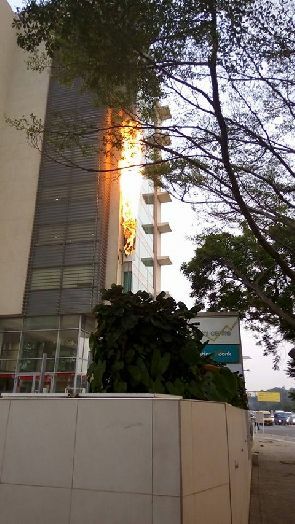 The fire which affected the signage of the centre could not extend to other parts of the building following a prompt response by the GNFS which quickly deployed a team to control the fire. Though the cause of the fire is not yet known, the Regional Commander for Greater Accra, Deputy Chief Fire Officer Ebenezer Simpson, said it could be as a result of an electrical fault. The fire started at 6:10am on Saturday from one of the signage on the eight-storey building. Mr. Smpson told Citi News’ Zoe Abu Baido that the security personnel on duty at the centre attempted controlling the fire but were unsuccessful and thus called on the fire service. He said it took his men few minutes to get to the scene adding that they managed to put the fire under control. “It didn’t affect any property inside. Also, nobody was hurt because we managed to get everyone out of the building,” Chief Fire Officer Simpson added. This comes to three the number of fire incidents recorded in the country in the last few days. A gas explosion at La in the Greater Accra claimed about six lives while scores of others were injured. Previous articleThe Gbese Youth in Greater Accra have stated that there is no basis for calls on the Gbese Mantse to step down since the National Democratic Congress (NDC) won in the jurisdiction of the chief. Next articleGhana’s Parliament has approved a tax waiver of 255 million dollars for the supply of two powerships from Karpower in Tema and Sekondi.